The big news of the week was the employment report, showing a "disappointing" +36,000 increase in jobs in January. Meanwhile, the separate household survey showed that the unemployment rate dropped 0.4% to 9.0%. Yesterday there was a lot of head scratching. Today there are two good summaries making sense of it all from Prof. James Hamilton and Dean Baker. The employment report contrasted with extremely strong, multi decade highs in the ISM and Chicago manufacturing reports, and a very strong non-manufacturing report as well. Meanwhile personal income and spending both rose. Slightly more autos were sold in January than December. 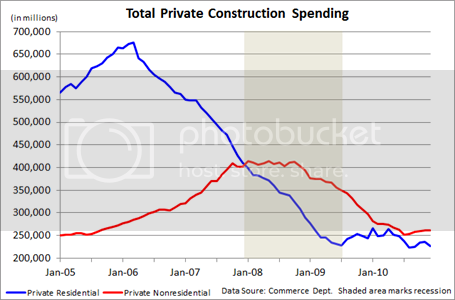 Residential and nonresidential construction both declined in January, but it seems increasingly likely that nonresidential construction has already bottomed. I plan on getting down deep into the weeds with several posts dissecting the employment information next week (one of which will explain the quotes around the word "disappointing" above). The BLS reported initial jobless claims of 415,000, and the 4 week moving average rose slightly to 430,500. The trend to under 400,00 claims is for now halted. The Mortgage Bankers' Association reported an increase of 9.5% in seasonally adjusted mortgage applications last week, which still has this series below recent highs, and essentially in a flat range since last June. Refinancing increased 11.7%, but is still near its lowest point in a year, due to higher mortgage rates. Gas at the pump decreased 1 cent to $3.10 a gallon, while Oil ended the week at about $89 a barrel. Gasoline usage was lower than last year, by 54,000 barrels a day. This is the first negative YoY reading in a while, and suggests that gas prices may be beginning to "bite" (or it could just be particularly lousy weather). The American Staffing Association Index increased 1% to 90 for the week ending January 23. This was 14% higher than a year ago, and only about 9% below the peak January levels from 2008. This is once again the closest so far the index has come to pre-recession levels. Railfax showed seasonal improvement as would be expected. Total rail shipments were 6.6% higher in the week ending January 29 than during the same week last year. Shipments of waste and scrap metal and auto shipments remain at last year's levels. In general rail traffic is still improving YoY, but the rate of that improvement has been decreasing for months. If the YoY comparisons remain week for a couple more weeks, then the slowdown cannot be dismissed. The ICSC reported that same store sales for the month of January increased 4.2% YoY. Shoppertrak reported that sales rose 4.3% YoY for the week ending January 29, even though they declined 6.1% from the week before. Weekly BAA commercial bond rates fell slightly to 6.08%. This has been in a range within 0.20% for over two months. This compares with a 0.02% decline in the yields of 10 year treasuries, which have also been in a tight range for over a month. M1 was up 0.5% w/w, up 0.6% M/M and up a strong 9.4% YoY, so Real M1 is up 8.0%. M2 was down 0.4% w/w, up 0.1% M/M and up 4.2% YoY, so Real M2 is up 2.8%. Both of these are in ranges where economic expansion has always taken place. A reminder that on a trial basis I am using Matt Trivisonno's +1.07% adjustment to withholding data this year vs. last year, due to the recent payroll tax political deal. So adjusting, the Daily Treasury Statement showed adjusted receipts for the month of January of $154.3 B vs. $140.4 B a year ago, for a gain of almost +10% YoY (although this January had one more reporting day). Drive carefully if you are in an area of snow and ice, and have a nice weekend! 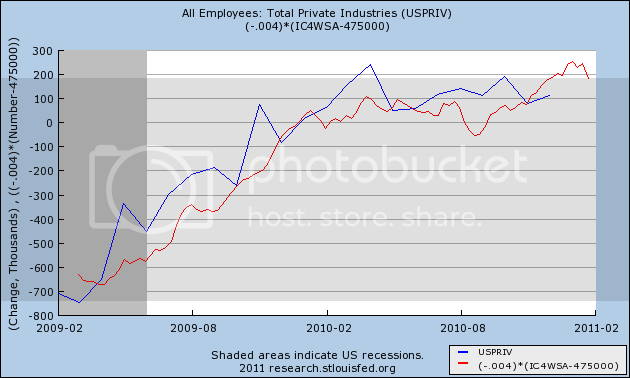 Is There Something Wrong With the BLS Employment Model? The following is pure conjecture. I have do data to support my central thesis. Is there something wrong with the BLS methodology? I wouldnd't say this except for the fact that its data now seems to be providing what are outliers to other data, even other data related to employment. The other thing to consider is that the BLS really didn't pick up the move into recession jobs wise in 2008. Years later, those numbers have in some cases been massively revised downward. Let me make two observations. 1.) The recession of 2008 was incredibly severe. According to the latest data, the economy lost over 8 million jobs. There was a period when the economy was shedding over 600,000 jobs/month. This could throw off any statistical gathering service. 2.) Starting sometime over the last 12 months, we have the great wave of baby boom retirements beginning. This will greatly alter the employment data in God knows how many ways, along with the underlying assumptions of employment data collection. I bring this up because of an email conversation I had today where all the participants explored the idea the BLS is simply trying to figure out what is going on right now and not having any answers regarding the employment situation. In addition, there is the question of whether or not the standard BLS methodology is out of sync with the current economic situation. This does not mean that the employment situation is better than reported. For all we know, if the above situation is accurate, the employment situation could be worse. But the last few employment reports have been downright from a variety of angles. Ultimately, we don't know if the above statement is accurate or not, so please do not take it as anything but an open question to which we will probably never have an answer. However, given the severe shocks to the economy over the last 2-3 years and the underlying changing dynamic of the labor force, we may also be dealing with a time when the numbers almost seem completely and totally random (i.e. they have no underlying logic/sense to them). The unemployment rate fell by 0.4 percentage point to 9.0 percent in January, while nonfarm payroll employment changed little (+36,000), the U.S. Bureau of Labor Statistics reported today. Employment rose in manufacturing and in retail trade but was down in construction and in transportation and warehousing. Employment in most other major industries changed little over the month. Interestingly enough, the civilian non-institutional population decreased from 238,889 to 238,704. This is basically the entire population of people who could be working, save those not in prison or in the military. So in January, the largest population group used in BLS calculations decreased. This is, frankly, a bit odd. The civilian labor force decreased by 504,000 (153,690 to 153,186). This is the denominator in several important calculations. However, the total number of unemployed also decreased by 622,000 (from 14,485 to 13,863). This makes a large percentage of the drop from 9.4% to 9% a legitimate drop in the unemployment rate. 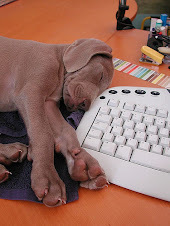 Persons who are neither employed nor unemployed are not in the labor force. This category includes retired persons, students, those taking care of children or other family members, and others who are neither working nor seeking work. Information is collected on their desire for and availability for work, job search activity in the prior year, and reasons for not currently searching. Remember -- we're seeing the beginning of the baby boomer retirement now. This will have a profound impact on employment numbers going forward. Finally, the number of employed increased from 139,206 to 139,323, or an increase of 117,000. So, the household report shows a large decline in both unemployed and the civilian labor force, making the drop in the unemployment rate a legitimate drop. Looking at the establishment report, we see the following. Goods producing industries added 18,000, with the drop in construction (32,000) offset by an increase in manufacturing (+49,000). Private services increased by 32,000. There was a dearth of hiring in all industries and a surprise drop in transportation and warehousing (-38,000). Average weekly hours decreased (34.3 to 34.2), but average hourly earnings increased from ($22.78 to $22.86). The decrease in hours is concerning, as there is already a tremendous amount of slack in this number which needs to be absorbed before we see job creation pick-up. However, the increase in earnings was large enough to offset the decrease in hours, sending average weekly earnings higher ($781.35 to $781.81). Overall, I'd give this report a 3.5 on a 1 to 10 scale. While the drop in the unemployment rate is encouraging, it's not due to job creation, but the beginning of the baby-boomer retirement wave. In addition, total hours worked is still low, meaning employers have a fair amount of slack they can take up before adding to payrolls. 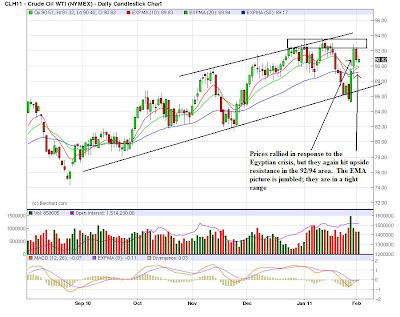 Last year the economy was doing well until two events occurred: the EU situation and the gulf oil spill. Those two events pushed back progress and began talk of a double dip recession. However, by late summer or early fall, it became obvious that talk of the impending drop into the fiery pits of hell were overblown. But, there was still a dearth of data to show the economy had turned the corner. Now one can make the argument. Let's start with top line economic growth. The economy has now printed six quarters of GDP growth. Simply put, economies grow in an expansion, not a contraction. Next, let's turn to retail sales. The Christmas season was the best in several years. More importantly, consumer spending is now at levels higher than the previous expansion, and retail sales have been printing some strong numbers for the last several months. The data indicates the consumer has returned and with the savings rate fluctuating between 5%-6%, there is plenty of ammo to keep spending. Next, look at manufacturing, which the recent Beige Book also indicates is doing well. However, we've had two great data prints this week -- the first from Chicago and the second from the ISM -- indicating that manufacturing is on track -- in fact, more than "on track;" on fire. A cheaper dollar and strong overseas growth should help manufacturing to keep the momentum up. Services are also in decent shape, although not as good as manufacturing. This does not mean they are in a recession, but it does mean that on a scale of 1 to 10, they're probably 6.5; they're in OK shape, but also appear to be turning the corner. However, with an expanding economy, this sector should continue improving. (UPDATE: The latest ISM was strong as well, printing a stronger number). Employment also finally seems to be improving. While weekly initial claims have jumped around for the last month, the problems have been administrative, but fundamental. The last two ADP reports have been good and while the BLS data has been weaker, NDD has correctly noted the data has been positive for some time and all the revisions have been positive. Housing is still a basket case and will continue to be for for some, largely because of a massive inventory overhang. But if that hasn't killed the recovery yet, then it probably won't. In short, the data (I know, those pesky facts again) indicate the economy has expanded for over a year and most of the underlying components are improving. There has been enough data over a long enough period of time to indicate we're turned the corner. This morning the BLS reported weekly initial jobless claims of 415,000. The 4 week average is 430,000. For now we have answered the question as to whether jobless claims would continue to decline under 400,000, or were simply establishing a new plateau -- it is the latter. The new plateau is a range between 410,000 at the low end and 450,000 at the high end. I would want to see at least 2 weekly reports under 395,000 before considering that a change from this new range is taking place. All of which is prologue to the point that we can probably toss a large part of what we thought we knew about job creation in the last 2 years into a cocked hat tomorrow, when the BLS announces its yearly revisions that match actual payroll reporting from tax payments to the data. Officially this will only correct the results from March 2009 to March 2010, but the BLS will re-estimate all of the numbers since then as well. While we know that we will find out that 2009 was even worse than reported so far (by about 330,000), the real puzzle is what will happen to 2010's monthly payroll reports. Since the BLS tends to underestimate jobs in the first year of a recovery, it is just as likely that they will be revised higher as lower. Private-sector employment increased by 187,000 from December to January on a seasonally adjusted basis, according to the latest ADP National Employment Report® released today. The estimated change of employment from November to December was revised down by 50,000 to 247,000 from the previously reported increase of 297,000. This month’s ADP National Employment Report suggests solid growth of private nonfarm payroll employment heading into the New Year. The recent pattern of rising employment gains since the middle of last year appears to be intact, as the average gain over December and January (217,000) is well above the average gain over the prior six months (52,000). Strength was evident within all major industries and across all size business tracked in the ADP Report. This was another strong report this week. We've had two great reports from the manufacturing sector and now a report that shows employment growth. The downward revision is disappointing, but its still in the 250,000 range, meaning its still a win. 1.) 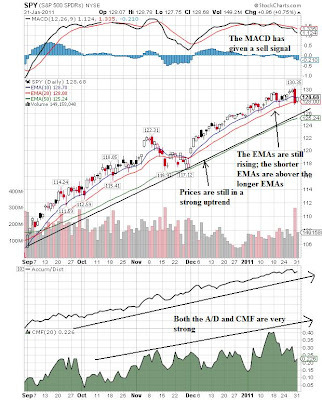 The market is still moving higher, although the higher risk averages (QQQQs and IWMs) are weakening. 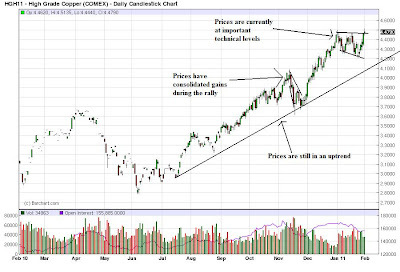 Essentially, the rally is getting long in the tooth, but the basic economic numbers have been incredibly strong this week, giving further upward momentum to the market. 2.) The Treasury market continues to consolidate. 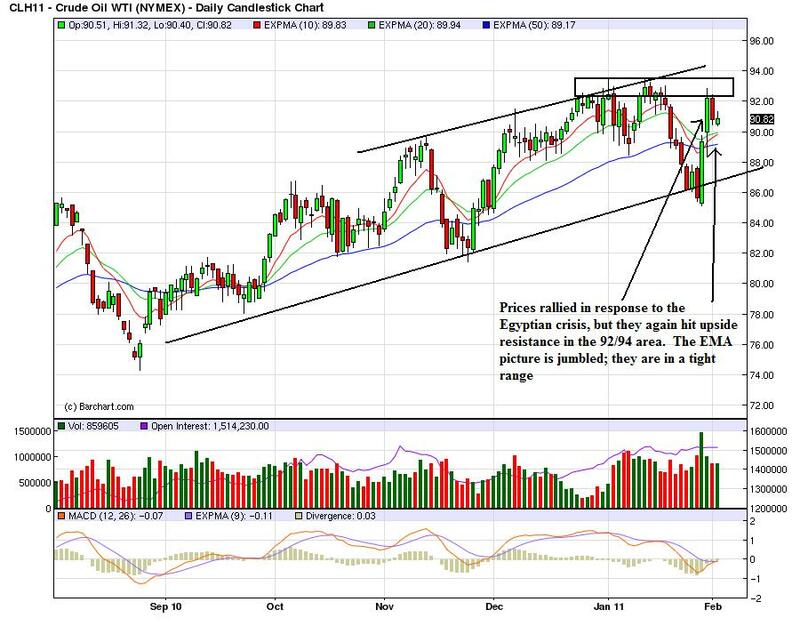 There is a strong big from the Fed and political events, but not enough to send the market higher. In addition, political events are keeping a safety bid underneath. 3.) 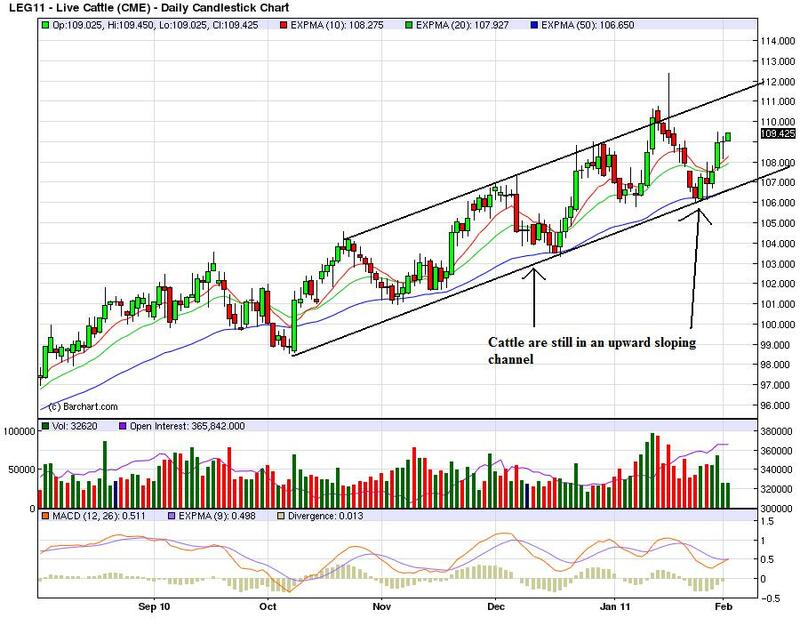 The dollar is approaching key technical support. 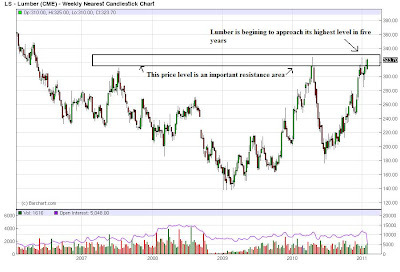 This will place a bid into the commodity markets, which are already moving higher from supply/demand issues. "The manufacturing sector grew at a faster rate in January as the PMI registered 60.8 percent, which is its highest level since May 2004 when the index registered 61.4 percent. The continuing strong performance is highlighted as January is also the sixth consecutive month of month-over-month growth in the sector. New orders and production continue to be strong, and employment rose above 60 percent for the first time since May 2004. Global demand is driving commodity prices higher, particularly for energy, metals and chemicals." Of the 18 manufacturing industries, 14 are reporting growth in January, in the following order: Petroleum & Coal Products; Primary Metals; Apparel, Leather & Allied Products; Wood Products; Computer & Electronic Products; Transportation Equipment; Fabricated Metal Products; Machinery; Paper Products; Miscellaneous Manufacturing; Chemical Products; Furniture & Related Products; Food, Beverage & Tobacco Products; and Electrical Equipment, Appliances & Components. The four industries reporting contraction in January are: Textile Mills; Printing & Related Support Activities; Plastics & Rubber Products; and Nonmetallic Mineral Products. Like the recent Chicago PMI, this report is also strong. Numbers are the highest in years and the vast majority of industries are expanding. 3.) There is still reluctance for hiring. Manufacturing continued to grow in January as the PMI registered 60.8 percent, an increase of 2.3 percentage points when compared to December's seasonally adjusted reading of 58.5 percent. A reading above 50 percent indicates that the manufacturing economy is generally expanding; below 50 percent indicates that it is generally contracting. A PMI in excess of 42.5 percent, over a period of time, generally indicates an expansion of the overall economy. Therefore, the PMI indicates growth for the 20th consecutive month in the overall economy, as well as expansion in the manufacturing sector for the 18th consecutive month. Ore stated, "The past relationship between the PMI and the overall economy indicates that the PMI for January (60.8 percent) corresponds to a 6.4 percent increase in real gross domestic product (GDP) on an annual basis." ISM's New Orders Index registered 67.8 percent in January, which is an increase of 5.8 percentage points when compared to the seasonally adjusted 62 percent reported in December. This is the 19th consecutive month of growth in the New Orders Index. A New Orders Index above 52.1 percent, over time, is generally consistent with an increase in the Census Bureau's series on manufacturing orders (in constant 2000 dollars). ISM's Production Index registered 63.5 percent in January, which is an increase of 0.5 percentage point from the December reading of 63 percent (seasonally adjusted). An index above 51 percent, over time, is generally consistent with an increase in the Federal Reserve Board's Industrial Production figures. This is the 20th consecutive month the Production Index has registered above 50 percent. Simply put, this is another stellar report from the manufacturing sector. Notice that for the last six months, nonresidential spending has essentially been flat - and the lowest reading was actually in July. 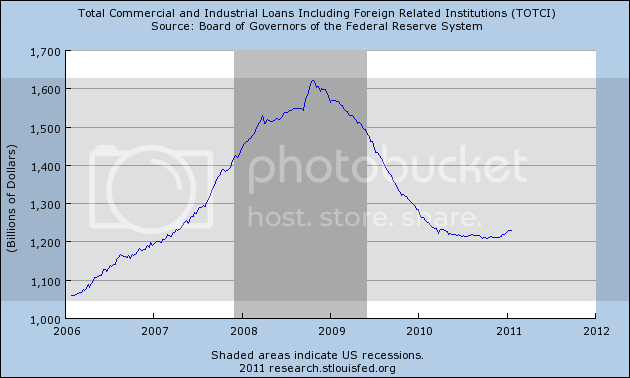 In any event, what is clear is that its 2 year decline from mid-2008 has been broken. 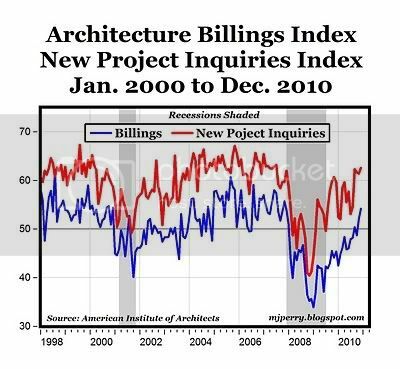 One of the reasons for more optimism about how the economy will perform in 2011 is that it will no longer be fighting against a decline in both residential and nonresidential spending. In fact both may begin to show at least some increase. Which also means at least a few construction jobs - finally - being added to payrolls as well. "The idea that taxes are high right now is pretty much nuts," says Michael Ettlinger, head of economic policy at the liberal Center for American Progress. The real problem is spending,counters Adam Brandon of FreedomWorks, which organizes Tea Party groups. "The money we borrow is going to be paid back through taxation in the future," he says. Individual tax rates vary widely based on how much a taxpayer earns, where the person lives and other factors. On average, though, the tax rate paid by all Americans — rich and poor, combined — has fallen 26% since the recession began in 2007. That means a $3,400 annual tax savings for a household paying the average national rate and earning the average national household income of $102,000. This tax drop has boosted consumer spending and the economy, which grew at a 3.2% annual rate in the first quarter. It also has contributed to the federal debt growing to $8.4 trillion. Taxes paid have fallen much faster than income in this recession. Personal income fell 2% last year. Taxes paid dropped 23%. 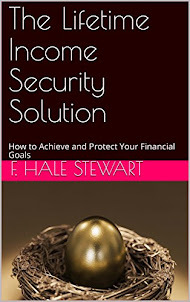 The BEA classifies Social Security taxes as insurance payments and excludes them from the tax calculation. This is a debate the country needs to have in the worst way: the overall tax burden. Yet every time we try, we're told tax increases are simply off the table. Unfortunately, there is only one way to balance the budget right now: cutting spending and raising taxes at the same time. January 2011: The Chicago Purchasing Managers reported the CHICAGO BUSINESS BAROMETER improved to its highest level since July 1988, indicating expansion for a sixteenth consecutive month. This is a great report, plain and simple. It indicates the manufacturing sector is starting to hit on all cylinders. For more on manufacturing, see this summation of the latest Beige Book numbers. Going forward, there are two big road bumps. 1.) 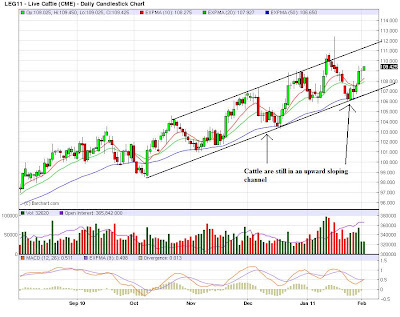 China slowing down: China has been a big driver during the current expansion. However, they are seeing higher then desired inflation levels, meaning their central bank is going to start increasing rates. The country will still be growing at strong rates; just not record breaking rates. 2.) Commodity prices: input prices are increasing, but with high unemployment there is little ability to pass the increases onto purchasers. There is some slack in the system according to the latest capacity utilization numbers, but that won't last forever. In addition, the latest Beige Book report indicated that in some districts, capacity utilization is near pre-recession levels. 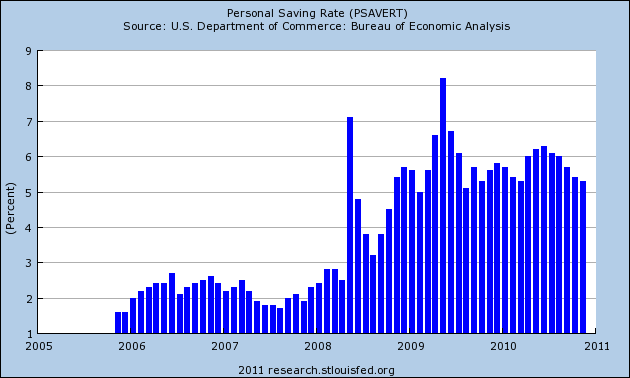 The chart above shows the U.S. savings rate, which has been clocking in between 5%-6% for almost two years. This is an incredibly importance development for a variety of reasons. 1.) First, it indicates that people are not spending all of their earnings at once, but instead are putting some money aside for a "rainy day." 3.) 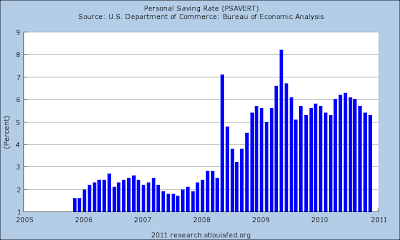 Increased savings also helps to keep interest rates low. Increased savings leads to a larger pool of money for financial intermediaries to lend, which lowers interest rates. 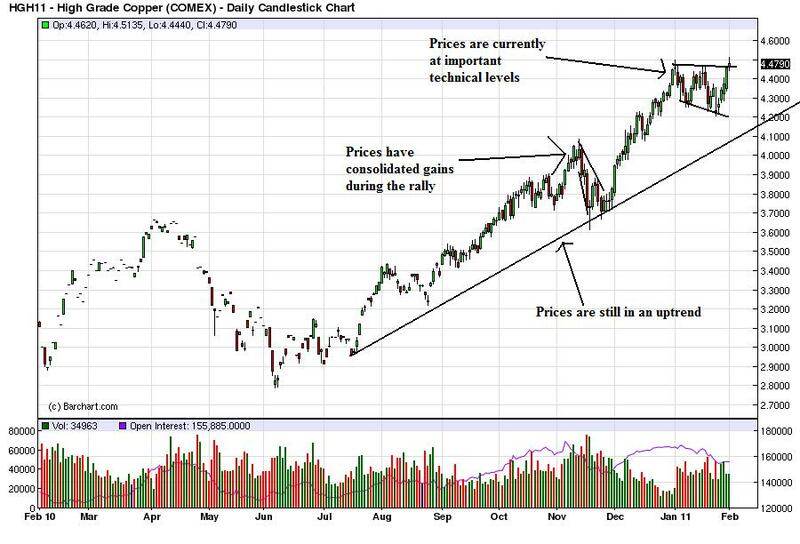 So the case for a speculative component is a lot stronger this time around. 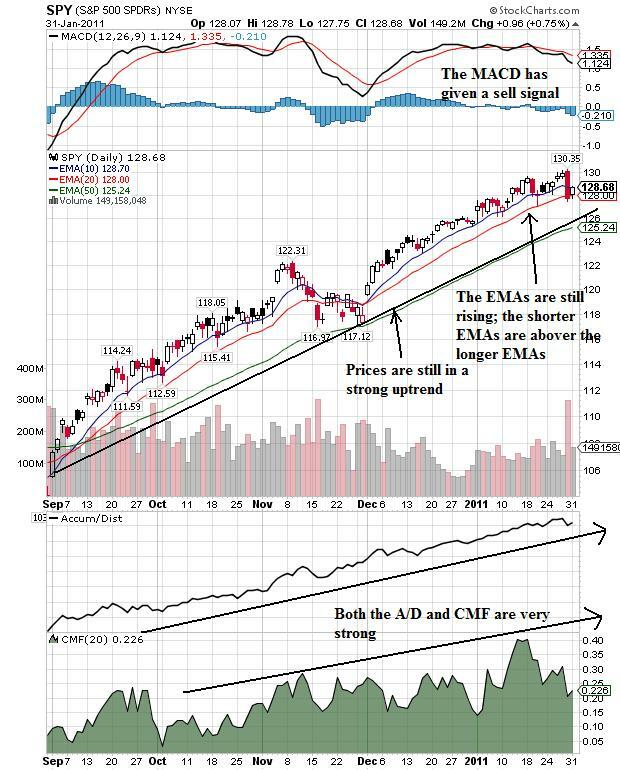 But — and this is important — the speculation is not being driven by financialization, by all those index fund investors going long. 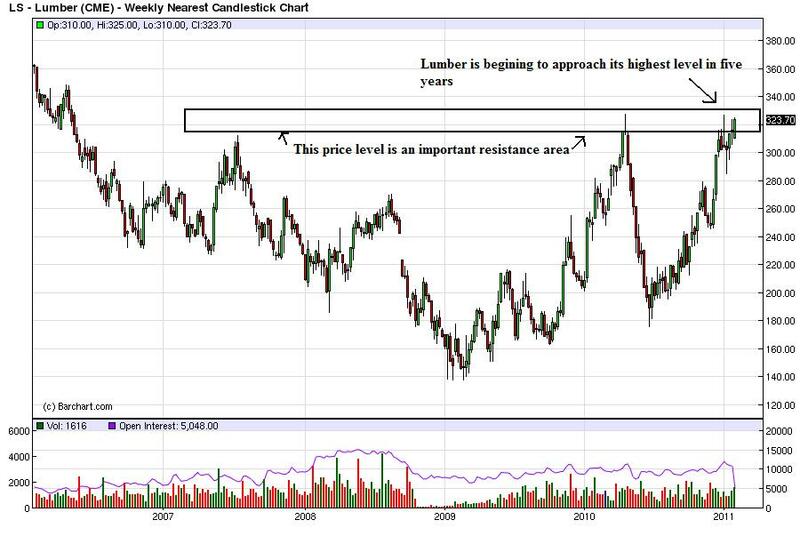 Cotton hoarding seems to be taking place at the level of individual Chinese farmers and factories, with no indication that they’re being influenced by the futures market. And iron ore hasn’t been available for futures-market speculation: the first futures markets there came into existence just a few days ago. 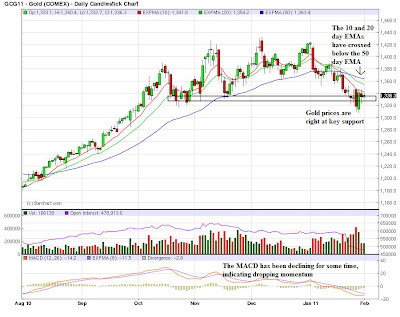 For at least some commodities, then, we’re seeing a real demand boom, which may be getting reinforcement from speculative hoarding, but with this speculation taking old-fashioned forms rather than involving Wall Street. Now, what about food prices? Not much evidence of hoarding, as far as I can tell. So this is straightforward supply and demand. Demand may be up to some extent because of that emerging-market boom. But if you look at the FAO reports it becomes clear that the key thing for cereals prices is that production is down in advanced countries, largely owing to terrible weather. And yes, it’s likely that climate change has played a role. This is what we've been saying all along. Yet America remains by far the No. 1 manufacturing country. It out-produces No. 2 China by more than 40 percent. U.S. manufacturers cranked out nearly $1.7 trillion in goods in 2009, according to the United Nations. 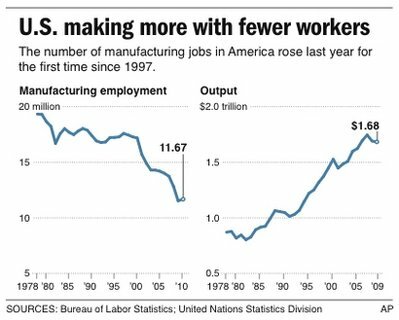 The story of American factories essentially boils down to this: They've managed to make more goods with fewer workers. The United States has lost nearly 8 million factory jobs since manufacturing employment peaked at 19.6 million in mid-1979. U.S. manufacturers have placed near the top of world rankings in productivity gains over the past three decades. That higher productivity has meant a leaner manufacturing force that's capitalized on efficiency. "You can add more capability, but it doesn't mean you necessarily have to hire hundreds of people," says James Vitak, a spokesman for specialty chemical maker Ashland Inc. This is a very important point to make. The internet is full of chatter about how the U.S. is always falling behind in manufacturing. Yet, we're still the world's largest manufacturer. As we've pointed out here on several occasions, the issue is productivity: the U.S. manufacturing is in fact incredibly efficient.